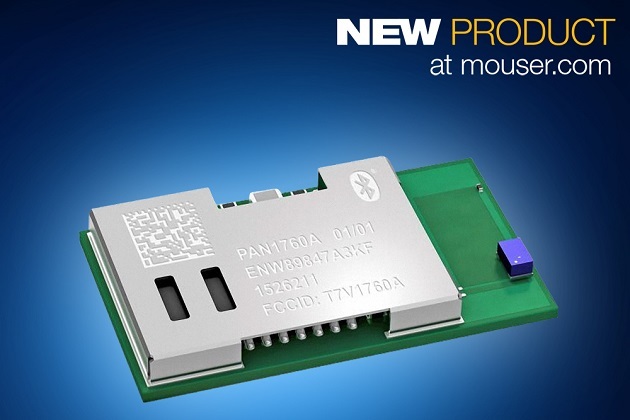 Mouser Electronics, Inc., is now stocking the PAN1760A Series RF module from Panasonic. The low-power Bluetooth low energy module offers years of operation using only a CR2032 battery for simple and reliable Internet of Things (IoT) designs. The Panasonic PAN1760A module, available from Mouser Electronics, is a fully autonomous device based on a Toshiba TC35678 system-on-chip (SoC) with an Arm Cortex-M0 core and embedded Toshiba Bluetooth 4.2 low energy stack. With integrated 256 Kbytes of flash and 83 Kbytes of RAM for application code storage and execution, the PAN1760A is suited for stand-alone operation in many applications without the need for an external processor, which helps save cost, complexity, and space. PAN1760, PAN1761, and PAN1026 Bluetooth modules, enabling designers to easily migrate previously developed software such as Bluetooth low energy profiles and applications. The PAN1760A module benefits from a peak power consumption of only 3.3 mA in transmit (Tx) and receive (Rx) mode, enabling advanced wireless functionalities in IoT, medical, and industrial applications without compromising battery life. The module is supported by the comprehensive PAN1760A Evaluation Kit, which provides two USB dongles to allow designers to develop, run and debug code. The dongles feature breakout headers that provide an easy way to connect sensors and other devices for rapid prototyping.